A piece of art from legendary science fiction writer Norman L. Brisbane, author of such titles as “Beware Their Killing Hooves” and “To Be A Blurgen”, was recovered this week. The piece appears to be a rough drawn representation of the “Observatorium”, a location mentioned in his final short story “The Red Moons Of NeOrion”. 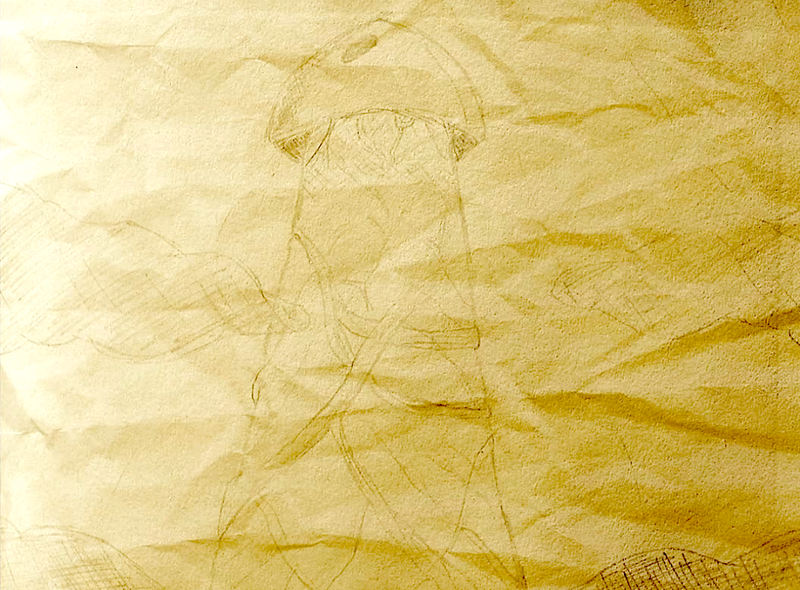 The drawing was made on a scrap piece of paper and found in the inside pocket of the coat he wore when he died. It hadn’t been found until now because the pockets were sawn shut with beard hair, Brisbane’s evidently, and in order to preserve the authenticity of the item, no-one had dared tearing the pockets open. Thankfully, a moth infestation in the New Jersey Science Fiction Museum opened up a hole big enough from the inside that the mangled piece of paper could be safely extracted. The structure conceived by Mr Brisbane looks every bit as imposing as it was described in the story. The vein-like detailing over the entirety of the pole suggesting the metal mentioned, “Expanseon”, had taken over it like a vine eating its way to the top of a tree. The dome looking very much grafted onto the pole almost organically. The lack of detail on the surrounding “schlouds” would suggest Mr Brisbane was more enamored with the shaft at the center of the piece. This truly is a major discovery for the world of sci-fi and one hopes that more artworks will be recovered from the legendary writer in time. Through the salivus, Krepp found The Observatorium’s core. He’d been in laboratories before, but nothing like this. For one thing, this wasn’t a laboratory. It was in fact The Sky Council’s meeting room complete with reverse-dome-shaped table, chair balls and the high-powered telescope used to take note of new lunar developments. All that was missing was The Council itself. Oddly nervous, Krepp slowly approached the telescope with the intention of looking through it and finally seeing the moons. That intention soon gave way to the action itself and just like that, Krepp was face to face with that which had ruled over him from the day of his birth. The moons were inside him and he loved them. He knew that now. He was home, he was happy, he was in love. This is what his entire life had been building up to and it had all been worth it. They were so beautiful: so peaceful, so round, so red. Just as he’d pictured them, more round even. He could hear wet sounds all around him but nothing could ever prove more worthy than this moment and he wasn’t going to let anything, not even a sound, get in the way of his eternal happiness. “That smell again…”, he thought. Perhaps he should allow his surroundings a second of his time, after all, he could always look back at his moons whenever he pleased now he was here. Reluctantly, Krepp looked away from the eye-piece and turned back to the table which, to his surprise, was not quite as bare as he recalled. Sitting all around was The Sky Council. At least, what looked like The Sky Council. It was strange, Krepp was surrounded by councilmen and yet the room still felt empty somehow. The members of The Sky Council looked like wet statues: they were near-static, their skins had a silver shine to them and they were dripping with what could only be described as grey things. “You’re not The Sky Council.”, Krepp said bluntly. Suddenly, at the center of the table, a silver shape began to materialize. Like a large, bubbling grey tear at first, it soon started taking on a more familiar form. “No Krepp, I am not The Chief Skyman. But then, you already know that.”, replied the entity. Krepp made no attempt to hide his confusion. As the entity noticed the drool trickling down Krepp’s chin, it spoke again. Without a word, Krepp climbed over the table and was now facing the entity. The entity smiled proudly, even as Krepp attempted to break its neck. It not being fully solid or fully liquid, it could not be brutalized in this way. Not knowing what to do, scared, Krepp started to run back to the hole but it was too late: it had already closed in on itself. Lost and confused, Krepp was now attempting to snap his own neck but in vain. The entity was now merging with the other entities around the table to form one large silver ball which started floating quietly towards a panicking Krepp. An otherworldly voice, like a dozen voices all speaking at once through a thin metallic shell, now emanated from the faceless shape, booming around the room. “The moons… sent you?”, Krepp asked sheepishly, looking up at the ball. His initial fears withering away with every passing second, Krepp finally understood. The moons were never getting closer: we were getting closer to them all along. Expanseon was a gateway, a force pulling us in. Little by little, the ball entered Krepp. Short flashes of Ham and Shp naked peppered his mind as his body, his soul and everything else gradually merged into the Expanseon. It was an almost instantaneous ceremony. In the blink of an eye: Krepp was no more. An immense earthquake followed, shaking the entire planet and killing most of its population, the Expanseon had finally wrapped itself around the entirety of NeOrion’s core. Acting as some sort of gravitational plug, The Observatorium and its pole started pulling NeOrion closer to the moons. The Expanseon ball which contained what once was Krepp among others had launched itself accross the skies forming a direct link between the planet and its lunar relatives. The growing heat and the change in mass crushing the last of the NeOrionians, it was not long before fire took over the entire planet. Meanwhile, on a nearby planet, a young-ling awoke from her slumber and approached a nearby window. This being an underwater planet, the window was made of water. Her male parent had just swam into the room after feeling an unexpected wave. This concludes Norman L. Brisbane’s “The Red Moons Of NeOrion”. He felt so light as he finally stepped onto the dome, it was like flying but on the ground. The Observatorium was so high up that Krepp felt as if he’d travelled to another planet altogether. All around him was sky: quiet, peaceful sky. What a feeling. There was something unique, religious about this place. Krepp understood The Sky Council’s solitude and, for a moment, he hesitated. Would the moons approve of his rebellious actions? Would he be punished for his disobedience? No. He was meant to make it to the Observatorium. His presence was no accident. If he had made the moons angry, surely they would have reacted by now. Taking a breath, he entered the dome. Luckily it wasn’t locked but then again, why would it be? Why would there be a lock? Why would it be closed? Why would it be open? Krepp felt light-headed. He wasn’t thinking straight. It was as if he had changed, somehow. The Observatorium walls were humid and soft. It was like entering a long-forgotten underground cave with a smell like no other and a taste salty enough to give the tongue something to think about. Krepp had never felt anything like it. There was little to no light source to speak of as he walked down that long, seemingly endless, corridor and not a sound. There was no such peace anywhere else on NeOrion, Krepp was sure of it. Could it be that he had finally found his home? His nest? No sooner had that thought entered his head that he heard a wet, ambiguous sound coming from the entrance he’d just penetrated. He promptly turned around to find that the entrance in question had been replaced by more wall: he was locked in. “No matter. The moons have their way.”, he thought. Krepp finally reached the end of the corridor and, to his surprise, he found no door, no branching path, nothing. Only that smell, getting stronger and stronger. Not so strong that it could be called overpowering but certainly impressive. It had a near hypnotic quality which both attracted and repulsed Krepp. Just then, a hole opened up in front of him: the wall was literally pulsating open before his eyes. Over the hole was a delicate, transparent film. Salivus. He’d recognize it anywhere. What was lying beyond this sticky portal? What did it all mean? Without hesitation, he stepped through. The Observatorium was a vast structure to say the least. Higher than any other construction on NeOrion, The Observatorium looked down on the physical and up at the spiritual unknown. Like a gateway between two worlds, its position ensured a clear view of both the red moons and their loyal subjects below. The Observatorium stood on top of a pole, its roots branching out deep below the ground like thousands and thousands of very hard tentacles. The pole was made of a rare metal called Expanseon, a metal born out of a meteorite which plummeted on NeOrion several centuries prior. It arrived on the planet in a thick liquid sphere under a near impenetrable layer of space rock. At first, the new element was feared as those who came in direct contact with it would find themselves engulfed by it instantly: it fed on them. And that’s what it was doing below the surface, feeding and feeding, slowly wrapping itself around the planet’s core. The NeOrionians learned to solidify and control Expanseon over time by starving it and then shaping it with wooden pieces of wood, made of wood. This is how the pole was achieved. Krepp’s law-pod was finally over the schlouds, level with the rotating turett. The Observatorium indeed rested on the pole but the dome-shaped location was also mobile in that it could spin around on itself, giving us a more complete understanding of the moons’ circumference. Krepp was moved by the sight of this shining, sparkling monument. It was a true symbol of the moons’ unlimited power and he was, for the first time in his life, well and truly happy. As he landed his law-pod over the dome, he couldn’t help but think that he would be the first NeOrionian to venture up the pole in centuries. The Sky Council had lived in complete isolation ever since it was founded in order to preserve the sanctity of The Observatorium. But with these new moon developments, Krepp felt drawn to that place. The moons were calling him, and he would answer them. Krepp’s earvision tablet vibrated, but he had been avoiding all calls from that morning onwards. He should have checked the bubblepod’s viscosity levels beforehand: the vibrations were not doing the flight any favours and Krepp could not afford a pop at this point in time. He had to answer it. His palm nearly on the tablet receiver pad, Krepp notices something in the bubblepod’s reflector. It was a blinking bubblepod. This was not a good thing. The authorities were after him and he had to lose them, but how? The earvision tablet still vibrating, Krepp suddenly got an idea. Pushing down on the accelerator, he flew the pod faster than ever before. The blinking law-pod was close behind, moving closer and closer the more salivus Krepp’s trembling pod was excreting. Forcibly freeing himself from the safety magma holding him seated in the pod, Krepp assumed a crouching position before letting go of the accelerator suddenly. Seeing Krepp stop all of a sudden, the law-roaches applied the brakes in their blinking pod. No sooner did they stop close to the pod ahead than its bubble popped and Krepp leaped out of it landing through their own pod. Promptly and without hesitation, Krepp snapped their necks before restarting the law-pod, which had instantly re-bubbled, and flying off into the distance. Was this the beginning? Was this the end? He knew more pods would come and this time, luck might not be on his side. Swallowing the last of the law-roaches, he soon looked up to see the giant pole leading up to The Observatorium. Krepp entered Ham, his mate. Their bodies now one, it all started to make sense. Krepp suddenly knew what he had to do and how to do it. Noticing Krepp’s shrinking interest, Ham looked up at him with concern. – “I’ll take your mind off those silly moons.” She said, her tentacles flapping from side to side. Climaxing despite his efforts, Krepp snaps Ham’s neck. “What has happened to us all?”, he thought, “Where are our values? Have we forgotten what the moons did for us? Giving us life, giving us light?”. As Krepp stood up, Ham’s lifeless body promptly pulled out of him and fell near the bed, the tentacles still flapping up and down. Looking out the window, Krepp could see the moons, the sound of the tentacles still resonating against the solid floor behind him. He had nothing left. Only the moons. The moon was red and hard, and so was the other moon. Krepp had never seen the moons this way, it frightened him. NeOrion was a world in peril. It was a dying planet, in fact. 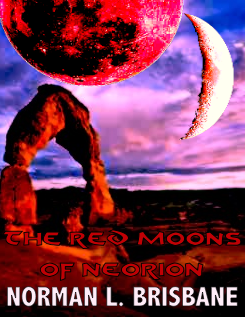 The red moons of NeOrion had kept the planet alive for aeons: their warmth, their energy, their pulse meant life could explode all around. But when “THE CHANGE” occurred, all sense and logic became a thing of the past. Fear now reigned among the NeOrionians: the moons were getting lower and closer. How long until they vanished altogether? Or even worse, made contact. Looking up at his people’s impending demise, Krepp swallowed his fear and thought: “I can’t be afraid, the moons have their way. Who am I to distrust them?”. Not knowing what to do, Krepp snapped Shp’s neck. Shp was Krepp’s sondaughter (for hundreds of years the sexes had merged into one unisex on NeOrion). The penalty for speaking ill of the moons being worse than instant death, Krepp had spared Shp much discomfort. Besides, with the end so near, what did it matter? He thought. It was on the facevision box that Krepp had first heard about “THE CHANGE”. In fact, that’s how most NeOrionians heard about it. NeOrion’s unique facevision channel, Channel A, had spread the news in the early hours of the morning. The Observatorium’s Chief Skyman had produced evidence that the moons were, indeed, beginning to orbit NeOrion and according to his calculations, the chances of them resurfacing were, in his words, “highly unlikely”. Further studies to determine how long NeOrion had left were still being carried out but so far had proven inconclusive. Impact or desertion would be the cause of the planet’s death, this was a definite, but at this stage The Sky Council could only speculate. More specifics would no doubt surface soon. Shp’s body having finally been cooked and eaten, as per the old ways of the Moon Elders’ sacred scrolls, Krepp once again started thinking about the end. His days, or even hours (who knew?) were numbered, what was left to do? How to best make use of his remaining time on NeOrion?